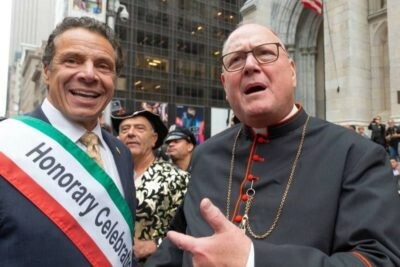 (CNA) Catholic leaders in New York have spoken out against the passage of an expansive new abortion law in the state. The Reproductive Health Act was passed on Tuesday, the anniversary of the Supreme Court decision Roe v Wade. In a statement from the New York State Catholic Conference, the state’s bishops called the passage of the law a new “sad chapter” on a date that already carried tragic associations for supporters of life. “If our governor, senate, and assembly has their way, abortion will be legal up to the moment of birth; those large numbers of healthcare professionals who find the termination of pre-born babies repugnant will have no conscience rights to object; trained physicians will be not be required to perform the dismemberment; and a baby who survives the scalpel, saline, or suction, and is still alive, can be left to die without any care.” “This is ‘progressive’?” Dolan asked. The bishops also requested prayers not only “for the conversion of heart for those who celebrate this tragic moment in the history of our state,” but also for “the lives that will be lost, and for the women of our state who are made less safe under this law.” There were many “celebrations” throughout the state after the law was passed. (CNA) While demonstrators chanted and played ceremonial drums, protesters at a rally led by Nathan Phillips attempted Jan. 19 to enter Washington, DC’s Basilica of the National Shrine of the Immaculate Conception during a Saturday evening Mass. The group of demonstrators was stopped by shrine security as it tried to enter the church during a Saturday evening Vigil Mass, according to a shrine security guard on duty during the Mass. “There were about 20 people trying to get in, we had to lock the doors and everything.” The guard said the incident was a disappointment during a busy and joyful weekend for the shrine. “We had hundreds and hundreds of people from all over the country come here to celebrate life, to celebrate each other together. That a protest tried to come inside during Mass was really the worst.” A source close to the shrine’s leadership corroborated the security guard’s account, telling CNA that during the Mass, Phillips and the group tried to enter the church while playing drums and chanting, and were prohibited from entering the building by security personnel, who locked the main basilica doors with the congregation still inside. (Agenzia Fides) On January 18, before the usual Friday Prayer, Maulana Abdul Khabir Azad, current Grand Imam of the Badshahi Mosque in Lahore and son of the late Abdul Qadir Azad, organized an interreligious conference to pay tribute to his father and invited Fr. Channan to preach from the pulpit of the mosque, and addressed all the faithful Muslims present. Fr. James Channan, who for years worked for interreligious harmony with Maulana Abdul Khabir Azad, addressing the large number of Muslims present and numerous other Islamic Muslim religious leaders, recalled Muhammad Abdul Qadir Azad as “a model for interreligious dialogue” , praising “his leadership and his passion for Islamic-Christian dialogue”. He then recalled that his son, Maulana Abdul Khabir Azad, “today plays an important role in building bridges between Christians and Muslims both at a national and international level”, thanking him “for opening the doors of this great Mosque of Badshahi to Christians and to people of other faiths, bringing the noble mission of his father to life”. Fr. James said that “if all Muslim leaders in Pakistan follow the example of these two great leaders, Pakistan will become a country where people of all religions will live in peace and harmony”.